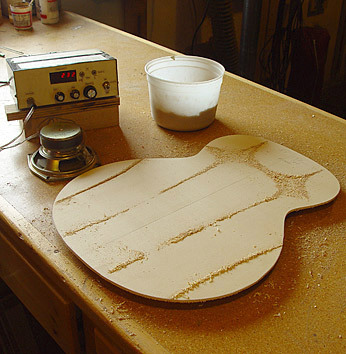 In August, 2007 I gave a talk at the Healdsburg Guitar Festival on the practical use of Chladni voicing techniques for guitar making. Emphasizing hands on practicality over theory, the talk explained how I use Chladni techniques in my day to day guitar building routine. Topics covered include: creating and interpreting Chladni patterns, top and back plate voicing, tuning the completed sound box, record keeping and much more. The information is the cullmination of over ten years and 100 guitars worth of experience with Chladni techniques. Originally a narrated slide show, I have reformatted the the presentation into a 68 page PDF and I'm now offering it for sale for $15. If you would like to purchase a copy, just click the "Buy Now" button to make your purchase via your Paypal account or with your credit card. If you would prefer a different payment option just email me to make payment and delivery arrangements. If you have already purchased the Chladni Talk and want to download it again, click here.